NASHVILLE, TN — Movement…cadence…progress…focused vision and imminent reality…not just the talk, but the walk all the way to China (so to speak)…and that’s what Councilwoman At-Large Sharon Hurt is all about right now. If you look up the term “mover- shaker,” her picture would be there as she traverses her way through Chengdu, and Chongqing, China as an honored guest of the government from Nashville traveling at her own expense. Hurt is also the leader of Jefferson Street United Merchants Partnership (J.U.M.P.). These are huge megacities with a combined population of about 13 million people, with many wealthy ones being quite desirous of investing heavily in Middle Tennessee, particularly Jefferson Street. And let me tell you…they are laying it all out in the grandest five-star style, and most obsequious manner being so honored, that Councilwoman Hurt took her personal time, funds, and efforts, along with her daughter Ciara to grace them with her open minded presence for what is possible between our cities. 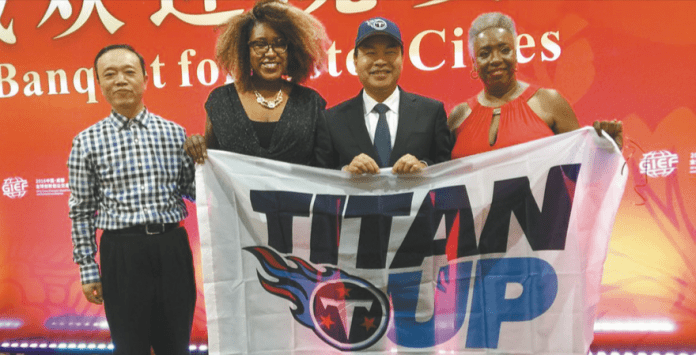 A few months ago, Councilwoman Hurt met the acquaintance of local Chinese businessmen Hsing Liu and Charles Li of InvestUS, during a meeting at the invitation of Mrs. Rosetta Miller Perry in the conference room of The Tennessee Tribune. It was also at- tended by Councilmen Ed Kindall and Freddie O’Connell, as well as prominent business people; Greg Beard, Pam Martin, Nate Harris, and a host of other business and land owners from the Jefferson Street area. InvestUS will be bringing tour groups to Nashville from China comprised of wealthy individuals who have a very serious interest in spending their cash right here in Middle Tennessee, simply put. What Mr. Liu told those present was that Chinese investors are willing to fund major projects in the Middle Tennessee area that include housing, schools, restaurants, car dealerships, salons, condos, retail spaces, boutiques, and especially, entertainment venues that capture the essence of such a beloved community…jazz and blues. Here is what Hsing Liu told the packed room, and Charles Li confirmed: “If you have an idea of what you want to do in this historic new area of downtown Nashville (uptown), have a clear and succinct plan in detail, it makes sense, and the numbers match to the point that an investor can make a seven (7%) percent profit…we will do it. All we want is a seven (7) percent profit.” And he repeated it four times. That sounds pretty simple doesn’t it? Afterwards, Councilwoman Hurt forged a relationship with the company and was asked to be their special guest on a tour of these major cities in China. She recently departed after the Jazz and Blues event and arrived in China after being delayed because of severe weather. Hurt began texting me about her experiences. Most of her texts extol the beauty of the country and the spirit of this foreign land that too few of us ever experience. She has shared the perfected excellence of the events, as well as, the tremendous outpouring of gracious treatment she has received in detail and pictures. INVESTUS held a conference meeting to introduce Nashville, TN. This is the display table which included Jefferson Street and Tennessee tourism information. Sharon Hurt is right. If the future prosperity of uptown is going to be realized it is incumbent upon those who want to live in it come together to support and encourage one another’s endeavors, campaigns, organizations, businesses, dreams, and events for the common good for Jefferson, and success for everyone. Factions and in fight- ing has to go away as cooperation and unity takes its place. Then, innovation and cooperation will have its perfect work in “The Next It City” and Jefferson will never be forgotten.